Orthokeratology (ortho-k) is a safe, non-surgical answer to myopia (nearsightedness), a vision condition where one cannot see distant objects clearly. Specialized rigid gas-permeable contact lenses (RGPs) gently reshape the cornea during sleeping hours to reduce myopia and other refractive conditions like hyperopia (farsightedness) and astigmatism. Patients enjoy functional vision during waking hours without glasses or contacts, and wear retainer lenses nightly to maintain the results. The procedure is non-invasive, reversible, and is a safe alternative to refractive surgeries such as RK, PRK, ALK, LASIK, and LASEK. Ortho-K was developed by a few optometrists and has been practiced for well over 50 years (since 1962). The public has not heard of ortho-k mainly because it began long before doctors were permitted to advertise as they do today. This is comparable to orthodontia, or dental braces, which was not willingly embraced by dental surgeons until the late 1970s. Today, braces are very common among children and adults. The same is true for orthokeratology (“braces” for the eye). Ortho-K is a safe, reversible procedure that is suitable for children and adults. 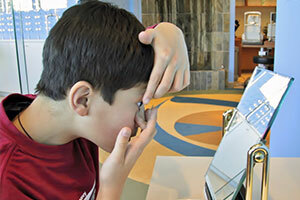 It is especially beneficial for school-aged children who often experience large increases in myopia every year. In addition to eliminating the need for glasses or contacts during the day, ortho-k may even decrease or arrest the rate of myopic progression. A little known fact is that myopia and other refractive conditions can be controlled easier when caught at the beginning. The results are often dramatic and swift, with noticeable results after the first night. Since ortho-k does not involve surgery, it does not suffer side effects of refractive surgeries (often permanent) such as scarring or burning of the cornea. In fact, patients who fail to achieve optimum vision after refractive surgery often require the expertise of an orthokeratologist to design specialty lenses and only such custom-design lenses can resolve their visual problems. When can I be free of glasses? This depends on the complexity of your case. Noticeable results are often achieved after the first night of lens wear, and generally there will be significant improvement within the first week. Some cases may take longer, depending on the amount of refractive error and corneal complexity. “Functional vision” is a term you will often hear in orthokeratology. One may or may not be able to achieve “20/20″ without glasses due to factors such as high myopia, corneal response, or discipline in lens wear. However, vision improves so greatly that one is still satisfied with the results, though it may not be “20/20″. Retainer lenses are then prescribed to maintain those gains. Is Ortho-K safe? Are there any side effects? Orthokeratology treatment has many benefits when performed properly and professionally. However, you are more than likely to experience problems and side effects if you choose an inexperienced doctor (or worse yet, a technician) to sell you lenses and provide substandard care. In some countries, the sale of ortho-k lenses is loosely regulated, and may be dispensed by someone who has no knowledge of eye health and physiology, and may not even have university training. The most serious problems, including vision loss, usually arise from improper lens care, poorly fitted lenses dispensed by unqualified/inexperienced people, or lenses made from dated lens materials that limit oxygen transmission and compromise corneal physiology. Keep in mind that this is a risk of any contact lens, and is not specific to ortho-k. It is therefore of utmost importance that you trust your eyes only to a competent, professional and caring orthokeratologist, and not just anyone who dispenses ortho-k lenses. How do I find a competent orthokeratologist? Ortho-K is a subspecialty of optometry, so a reputable orthokeratologist will be a Doctor of Optometry (optometrist) with proper qualifications, specialized training in orthokeratology, and is fully equipped in the office. Your doctor should have years of experience successfully fitting hundreds of patients, thousands of ortho-k lenses, and is able to target a wide range of prescriptions. He should have a broad knowledge of orthokeratology, different lens designs, and most importantly must constantly upgrade his skills to keep abreast with the latest technological advances. This professional should always strive to achieve the best result possible regardless of material cost, and such excellent service will have a bearing on the price you pay. On the other hand, many unqualified/inexperienced “orthokeratologists” take shortcuts by giving their responsibility to a lab technician (someone who has not even seen the patient) to design ortho-k lenses. Not surprisingly, their price will be cheaper, results often second-rate, and they cannot handle moderate to difficult cases. Their emphasis will be on their “better deal” and they will compensate for their incompetence by offering gimmicks like discounts, free spare lenses and lens solutions, price-cutting, etc. Like many things in life, buyers beware. Orthokeratology fees are comparable to those of refractive surgery and dental braces. The initial treatment cost involves the doctor’s professional service fee, cost of materials, and aftercare. Prices are based on the doctor’s skill, patient’s refractive error, and complexity of individual cases. A preliminary comprehensive eye examination including corneal topography is necessary to determine if you are a suitable candidate for treatment and an experienced orthokeratologist will be able to answer specific questions pertaining to your individual case.